A jogabilidade é bastante intuitiva, de uma maneira geral. Com a espada atacamos os inimigos usando a estratégia que mais se encaixa na situação, seja atacando pela frente, por baixo ou saltando em cima deles com a espada voltada para baixo. O escudo serve para nos defendermos de projéteis e alguns ataques (nem todos). O Interessante é o fato de que alguns inimigos não causam dano ao nos tocarem, exceto aqueles que tenham algum tipo de armadura, como espinhos ou fogo, algo que nem sempre é assim nos jogos do genêro onde qualquer toque do inimigo nos causa dano. A energia é semelhante a de The Legend of Zelda, inicialmente você começa com três corações e pode ser aumentada comprando armadura nova ou reunindo dez Life Drops para se obter um coração extra. As pessoas viviam em harmonia com as criaturas do planeta. Porém uma outra criatura das trevas não estava feliz com essa atual situação, e investe em ataques demoníacos diretamente nos corações das pessoas, como medo, ódio, avareza, e todos os outros pecados capitais. Numa era antiga, contava-se que em breve surgiria um herói que acabaria com todo o mal nos corações das pessoas, fazendo assim elas retornarem ao estado normal em seus corações. Mas ninguém contava que esse herói seria na verdade uma heroína. Seu nome é Asha. 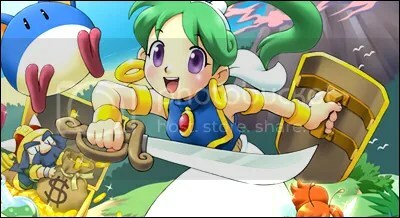 Asha é uma garota de cabelos verdes, e tem uma grande ânsia de ser uma aventureira. E ouve pedidos de socorro carregados pelo vento. Por isso ela parte em busca de aventura. Mais pra frente, ela se alia a um bichinho de estimação da raça pepelogo e dá um rumo às suas aventuras: salvar espíritos elementais para salvar o mundo. 1. Caixa de Life – Inicialmente você começa com três corações vermelho, podendo aumenta-los através da compra de armaduras na loja da cidade. Corações azuis vem por meio de Life Drops. 3. Dinheiro (Gold) – Dinheiro do jogo, a cada inimigo derrotado, é dropado uma moeda/saco de dinheiro. Valor da moeda/saco muda de acordo com o inimigo derrotado, sendo mais se o inimigo for poderoso. > Lâmpada do Gênio: Em Monster World IV, no momento em que você chegar á Rapadagna City pela primeira vez, você garanhará uma lâmpada mágica, ela serve para lhe levar de volta a cidade, então se você estiver enrascado ou sem life em alguma dungeon, use a lâmpada e volte para cidade para recuperar sua vida ou comprar itens novos. Organização das estátuas da esquerda para direita, ponha-as: Turtle, Leopard, Owl, Swallow e Witch. Da esquerda para a direita, ponha-as: Swallow, Witch, Leopard, Owl, Turtle. Da esquerda para a direita, ponha-as: Owl, Witch, Turtle, Swallow, Leopard. > Life Drops Playthrough ( Every Last Drop ): No total são 150 Life Drops espalhados no game, eles são facéis de se acharem, porém são missables! então eu sugiro imprimir esta lista que disponibilizarei, e ir marcando, sempre salvando todas as vezes que pegar um Life Drop. Clique aqui para ser levado a lista. Jogada única: O jogo em sí é simples de se fazer 100%, você só precisará ter cuidado em não perder um se quer Life Drop, pois se perder e salvar por cima, já era, ou seja será apenas uma única jogada. Use e abuse dos saves, você tem até 99 slots, ou seja, salve a cada fase criando assim um novo save, se fizer isso não terá problemas. Seguindo o roadmap e a playthrough dos life drops, não terá problemas. Collect 777 gold and see what happens. Este troféu deverá ser feito na primeira fase (Estahaan Point). Você precisa acumular 777 de Gold, porém se passar você perde o troféu, então você deverá fazer da seguinte forma: Na penúltima tela da fase Estahaan Point, na tela anterior a torre, existem 4 Gosmas de Fogo e 1 Cogumelo. Ignore o Cogumelo e fique matando as Gosmas de fogo saindo e entrando da tela, como se estivesse farmando em um jogo de RPG. Vá fazendo isso até se aproximar ao valor 777, ao se aproximar do valor, volte até a tela em que você mata a primeira gosma do jogo, exatamente essa gosma lhe dá uma moeda cada vez que você mata ela, e vá matando pra se aproximar do valor sem risco de passa-lo. Em 10-15 minutos você consegue . Collect all the Life Drops. Life Drops: No total são 150 Life Drops espalhados no game, eles são facéis de se acharem, porém são missables! então eu sugiro imprimir esta lista que disponibilizarei, e ir marcando, sempre salvando todas as vezes que pegar um Life Drop. 1-5 in the first house, in the back room talk to the lady, she will give you a chest with 5 inside. 6 in the screen after all the people waving goodbye, just after the bridge its in plain sight next to a tree. 8 in the screen after the save point, where you are introduced to the green blobs. Just before the end of the screen floating in mid air. 9 in the first forest screen, right before the screen ends floating in mid air. 10 a couple of screens later, still in the forest. Floating in mid air on a lower section, about midway through the screen. 12 When your first enter the tower head to the door on the far left. The life drop is in here right above a mummy. 13 in the room that was previously blocked off by silver blocks climb the rope and its at the of it just to the right. 14 inside the door you needed the key to unlock, its right above you when you enter. 18 In the locked door just to the right of the 4 platforms mentioned above, there is a rope. About halfway up on the right is the life drop. 19 After you have run through the hallway with the spikes and mummies and jumped on the ascending platform, head into the door closest to you on the left. In here you will find a green troll who when defeated will drop a life drop. 21-23 In the same room where you get your Pepelogoo egg and the Earth Medallion. Inside the middle chest on the bottom row. 24 After hatching your egg head back into the castle and where you went left for find the egg and the last 3 life drops head right. Here you will find the kitchen. The Life Drop is in the top left corner. Use Pepe to double jump up and claim it. 25-27 from the castle courtyard (in between the castle interior and the castles outer wall), use Pepe to double jump over the left wall. Here you will find a chest with 3 inside. 28-30 From the castle courtyard, this time head right. Use Pepe to traverse the buildings and you will eventually see a door and inside is a chest with 3 more. 31-33 From the last chest exit the door and head even further right, using Pepe to jump the buildings again. At the end you will find another chest with 3 inside. 34 In the city area, head into the first door you see and you will find a rich lady. Go through the back door and climb upwards. Head outside to find a Life Drop floating to the right. 35 From the last one, jump to the next rooftop. It is floating in the middle section of this rooftop. 36 In the next screen, jump on top of the first building and push up in between the 2 trees to reveal a chest with gold coins and a Life Drop. 46-48 In the room where you first use Pepe on the blue switches, head down to the bottom floor where the bridge is and avoid the fireballs while travelling right. Go past the next switch and your Life Drops are in the chest found at the other side of the bridge. 49-51 In the room with multiple fire geysers in a line and flaming ghosts, head all the way left and instead of going down, use Pepe on the last Fire geyser to reach a platform leading to a chest with the 3 Life Drops you are looking for. 52 In the room where you are dodging fireballs coming at you from the left, the Life Drop is on the an upper platform as you make your way through. 55 In the room with lots of falling fireballs that you have to glide down avoiding, there is a life drop on the far left wall as you glide down. I would HIGHLY recommend making a save before you make the jump as if you miss it you have missed it for good. 57 In the screen where you meet the lightning fish that jump out from underneath the bridge, there is a Life Drop at the very start floating just before the fish. 58 In the next screen there is a Life Drop hovering over one of the bridges. 59 In the next screen you will find a bridge right above another bridge, take the lower bridge to the right and find your life drop behind an electric slime. 64 As soon as you enter the pipe next to the heart machine, jump to get the life drop before being sucked into the pipe. 65 From where you first fill the bucket, drop down into the stream and jump up onto the first ledge you come to. If you haven’t picked anything off this ledge yet there will be a coin. The second time through there will be a heart and the third time through your life drop. You can keep going through this room as many times as you like so you have plenty of chance to collect those 3 items. 76 In the room with 5 streams going downwards, there is a Life Drop at the very top of the far left one. I would recommend saving before going for it because if you mess up and fall down the hole of the far left you can’t get back. 83 While heading towards the pyramid you will jump various spiky ice formations. Above one of the big ones that you jump over there is a life drop. Very hard to miss. 85 As soon as you go through the door that required the red code you will see it floating right above your head. 86 From the Leopard Statue, jump down the shaft and head right. Then head up the elevator you come to and go through to the room on the right. At the end of here you will find a heart machine and a door with a Life Drop floating above it. 87 Floating right above the door that requires the blue code with the witch statue behind it. 88 Above the door that requires the blue code on the opposite side from the blue door mentioned above. 89 From 88 go through the door and head all the way right. You will find yourself at an elevator shaft. The Life Drop is floating at the top of this shaft. 96 From the Leopard Statue drop down the false floor to the left and then head to the far left. In the next room the Life Drop is floating there in plain sight. 97 In the room right after you first meet the yellow bat, you will find yourself in an elevator shaft, drop down and then ride the elevator all the way up. The Life Drop is at the very top. 98 From the Witch Statue head left and find the secret door. From here head all the way left again and find another secret door Once in this door look left and see a chest. Life Drop is inside. 102-104 From the Owl Statue head into the first door you come to heading left. In here head to the far left side of the room to find a chest and 3 life drops within. 117 When you get the magic carpet and begin you glide over to the next dungeon, there will be clouds for you to jump on. The second set of clouds has a Life Drop at the end. 118 After 117 there is a Life Drop you need to drop down to. It has a few coins leading to it. You will land safely on a cloud. 119 Right after 118 you will meet some flying snake like enemies. 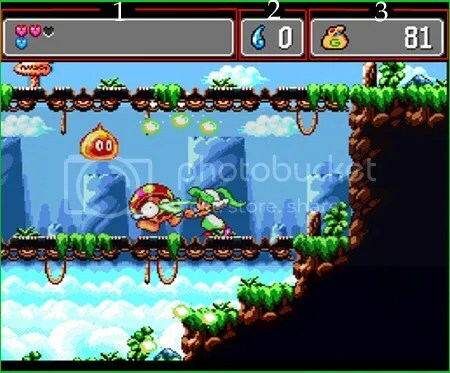 In the upper part of the screen the Life Drop is under an enemy, floating in mid air.Progress Check 11 Blue Hearts and 9 Life Drops. 120 In the room where you see the spinning spikes that you have to jump over, after jumping the first one, drop down and hit the spring. It will send you into another spring which will hurl you into the Life Drop. I’m pretty sure this Life Drop is unmissable. 121-123 From the above Life drop, continue on until you reach the ground floor. Here head right and through the electrical slimes and open the spike gate. In here a spring throws you upwards to a chain. Grab the chain and jump to the right and find another spring that will send you into the room on the left. Here you need to jump on the moving blocks and grab the chains. At the far left of the room is a chest with 3 Life Drops in it. 124-127 After the part where you kill your first 2 giant coins and had to run like the wind to get from the switch and up to the spiked gate in time. Just through that gate drop down where the chain is you will find 2 more giant coins and a chest with 4 Life Drops in it. 128 In the next room from 124-127 make you way across the moving mini conveyor belts. On your way upwards you will find a life drop floating. Use the spring on the right ledge to reach it. 129-133 In the room where you defeat the giant slime. After you defeat him head to the right. Past the chest there is a secret passage inside the wall. You will find a chest with a golden bar. Keep heading right through ANOTHER secret wall and open the chest. You will find a herb, but this will also trigger another chest to appear. Open that chest to find 5 Life Drops. 134 After heading out of the room with the giant slime, head through to the top left exit (The conveyor belts will have moved since last time you were in here) In the next room you will find a heart machine and yet more spinning spikes. Travel across 2 sets of these to find a ledge with a spring it it. On this ledge is a Life Drop. 135 From 134 use the spring to get up to the next ledge. Here is your next Life Drop. 137-139 In the next room where the fans blow you around towards the final boss of this dungeon. You will been blown through 3 Life Drops. I am pretty sure they are unmissable.Progress Check: 13 Blue Hearts and 9 Life Drops. 140 The first green troll you come to will drop this. Achievement Note: a few rooms after this one is the drop with the jellyfish. This is a very easy place to get your “Such Agility” achievement. 141-143 A couple of rooms after the Harpy boss, there is a chest with 3 drops in it here. 144-146 In the room after the Giant Chicken there are 3 gargoyles, each with their own Life Drop. Be careful here though as it is possible to kill them while they are inside the wall, making your Life Drop unreachable. 147 A couple of rooms after the Minotaur boss, you will see this Life Drop floating right in the shaft you need to jump down. 148-150 A couple of rooms after the Horse Boss, you will find 3 green trolls, each with their own Life Drop. Watch the SEGA logo sequence. Muito simples, ao iniciar um novo jogo, assista a introdução inicial em que apareçe a logo da SEGA. Atenção: Se apertar você irá pular a cena e perder o troféu. Find the “Welcome to Monster World” message. Troféu simples, porém pode ser perdido. Após derrotar o Boss da fase Sky Castle, você será levado á cidade (Rapadagna), siga rumo ao castelo e derrote a princesa pela segunda vez, logo após derrotar a princesa siga para a esquerda e caia no buraco (Underground Fort), ao cair no buraco, abra seu inventário ( ) e use a lampada do gênio (Lamp) apertando , você será levado de volta a cidade, siga rumo a direita até a tela em que tem um cara parado na frente da torre, fale com ele e o troféu pipoca. Wash your face in the spring at the Pyramids. Assim que completar a fase Ice Pyramid II, vá até o centro e fale com a Sphinx, ela irá lhe fazer umas perguntas, nesse momento, erre a primeira pergunta! Você irá cair em uns espinhos, em seguida vá na fonte ao seu lado esquerdo e pressione para lavar seu rosto. Just started and you’re already falling in pits! No ínicio do jogo, você deverá cair do penhasco do seu lado esquerdo propositalmente. Simples. Land 3 consecutive downthrusts without touching the ground. Você deverá acertar 3 Hits consecutivamente em um ou mais inimigos sem tocar no solo usando um único downthrusts. Downthrusts é o combo no qual você pula e finca a espada para baixo. Pula ( ) e + mantenha pressionado e direcionando. O primeiro lugar que você pode fazer isso é no primeiro nível, no final da segunda tela da floresta, apareçerão duas gosmas de fogo uma perto da outra, cada uma leva dois hits. Tambem tem uma CHEAT facil! Vai aparecer uma tela com todas as 52 musicas do jogo.